1. Pick candy that has a large center ring opening. I bought so many options so the children had an assortment to pick from. Here is what we used: Gummy Lifesavers, Sour Gummy Lifesavers, Gummy Ring Pop candy, Twizzler Rainbow, Red Vines and Sour Peach Gummies. You could also use hard lifesavers (my kids just prefer gummy). My daughter also decided it would be fun to add the Halloween Rings we bought for fun to incorporate in her necklace. But make sure your children don't eat them though! All of this candy is from Michael's or Target. 2. Buy a sturdy plastic cord/string to use. I found these Stretch Magic Silkies rubber necklaces from Michael's and they were so easy to use because they came with a built in clasp. The children didn't need any help getting started or finished! 3. 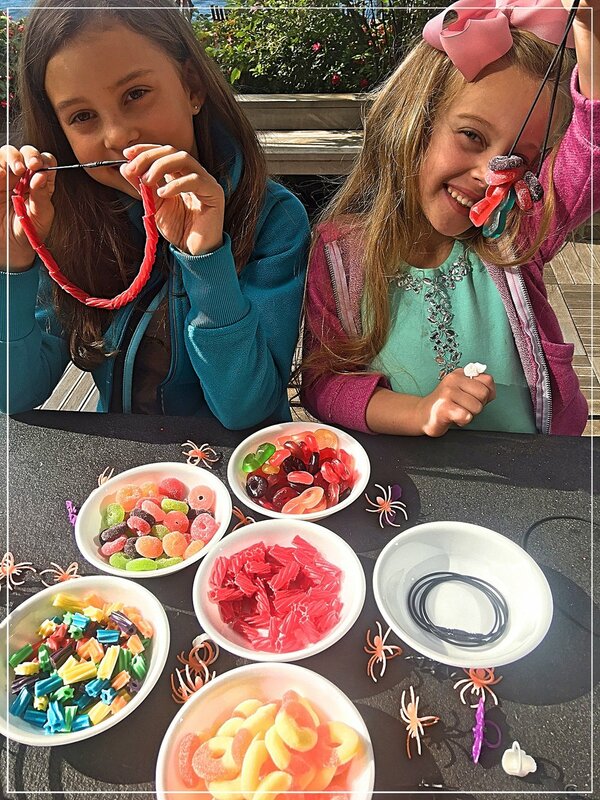 To start on the necklaces, remind the little ones to pinch one end so the candy doesn't fall of. Let the kids enjoy creating a beautiful edible and wearable masterpiece! Try this at your next playdate or Halloween Party and I'm sure it will be a smash! Leave comments or questions below. When that summer heat turns to crisp cool air, you know that fall has arrived. And this year September may be a little chillier than normal in NYC but we can still spend afternoons outside before the real cold winter weather hits. Here is a great way to use up all those apples you've all picked from the local apple orchard (see my post on Warwick, NY Apple Orchards)... Once you've made apple pie, apple crumble and apple whatever else you can think of to use up all those apples! Try this amazing and fun way to gather on a fall afternoon! Have the kids invite a friend or two over and get started. ***Please note that the children's shirts and hair may get wet so let their parents know in advance that their children may come home a little soggy. Or ask them for a dry shirt to change into before coming over. Cheers to a happy fall & I hope you enjoyed this post. What are some of your favorite fall fun activities?! Save yourself hundreds of dollars and give yourself some credit. Who says you need to hire a professional to get that professional looking shot of the kids? You probably take dozens of photos of them on a daily bases (I actually checked my phone and I did take almost 2 dozens picture of the kids yesterday)... and believe it or not but in the bunch there are at least two great pictures. Now add some natural lighting and a perfect backdrop and you have yourself that amazing picture you've been desiring. 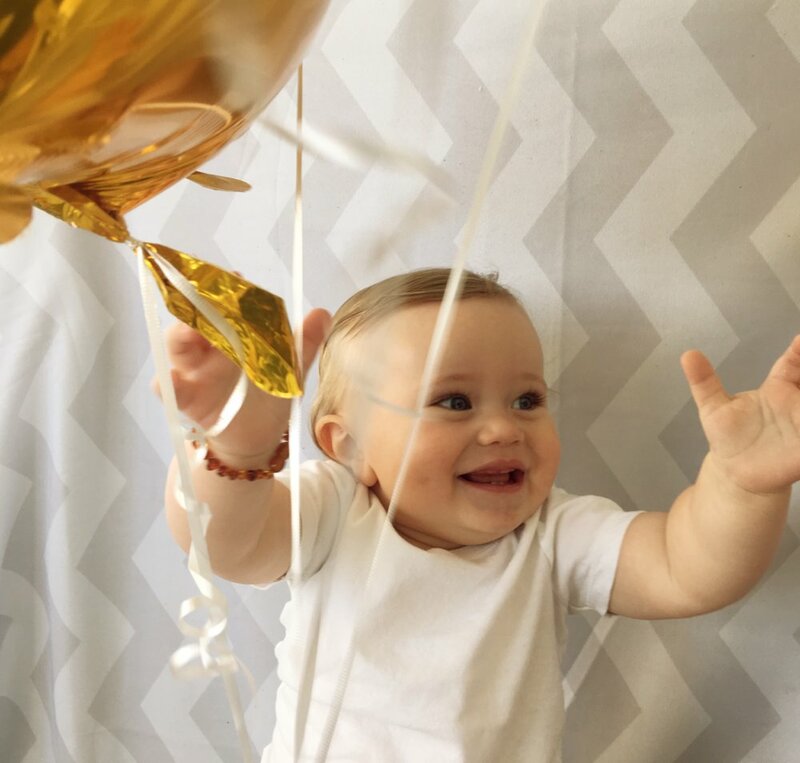 Like this one I recently took using the backdrop I bought at backdropoutlet.com for Brent's first birthday. I also included the bigger kids in some and wound up with so many amazing pictures I don't even know what to do with them. I wound up printing a bunch and using them as decorations for his birthday party. Not to mention we had the best time taking all sorts of pictures and poses. Sometimes the best pictures are the ones that aren't staged or orchestrated. We had so much fun together too!!! Let me save you a ton of money on this idea! Check out this 1st Birthday Signature plate that we made ourselves at home for Brent's 1st birthday party. These same plates sell for $30 or more online. But by simply doing it yourself can save you a ton! Plus it's way more fun. This is so simple and personalized! Everyone will be excited to sign it and your child will have this amazing keep sake forever. Share your party ideas below or tag us in your next DIY signature plate post!